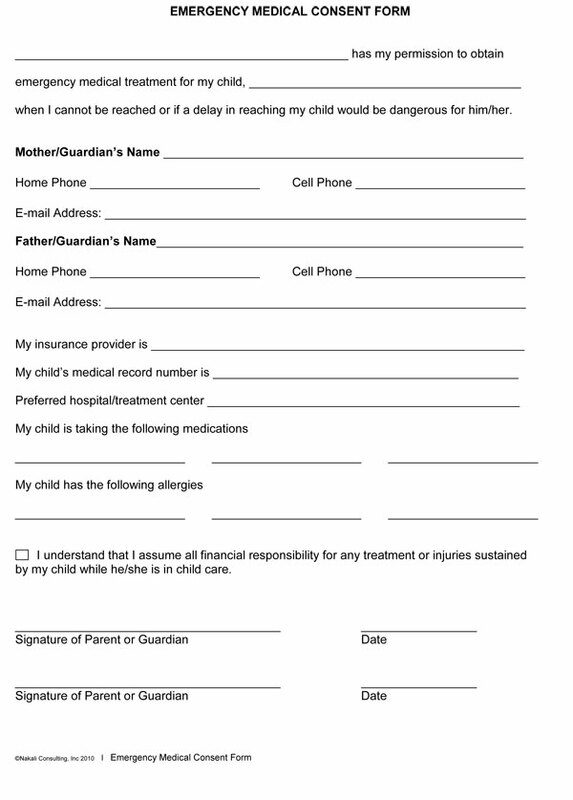 Caregiver Consent Form for Medical Treatment: When someone is caring for an individual and watching out for their day by day needs, that individual should be able to help the one that they are caring for receive medical treatment if such treatment is needed. If someone is babysitting a child, such an individual should be able to get medical treatment for that child if something goes wrong. A caregiver consent form for medical treatment can give an individual permission to get treatment for the one that they are caring for and helping. When an emergency situation comes about, it is important that all who are involved in the situation can receive the kind of help that they need and the treatment that is right for them. 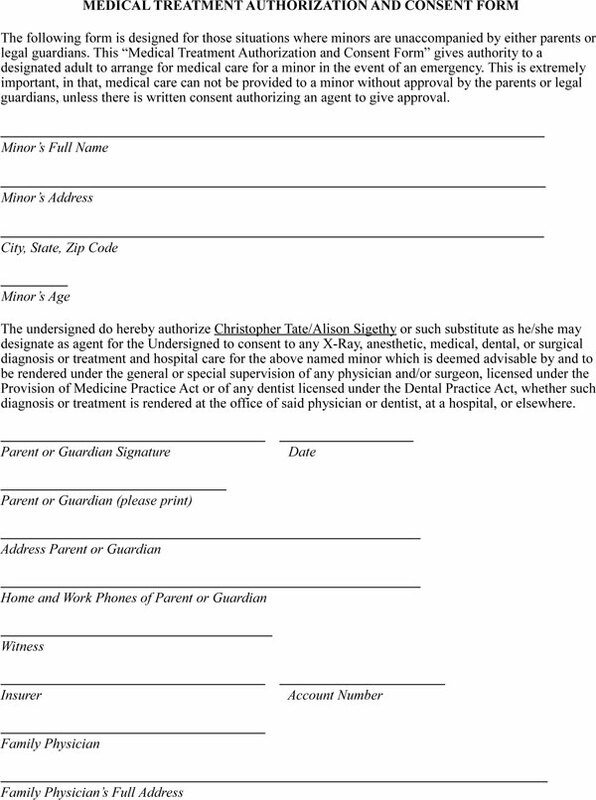 An emergency medical consent form can help an individual receive good care and treatment and it can give medical professionals the permission that they need to help an individual. 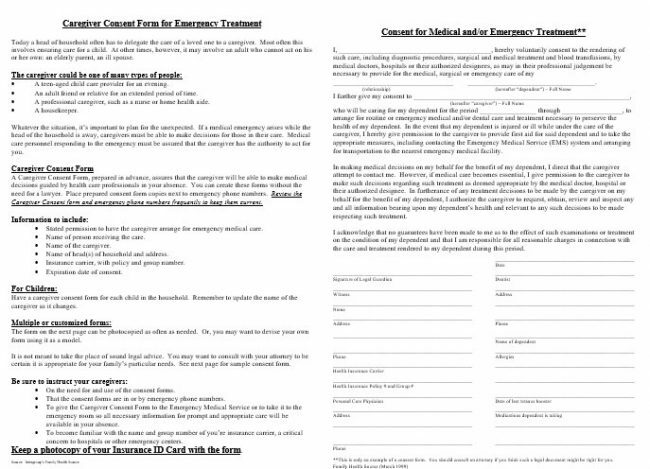 Those who are in a situation where they are suddenly in need of medical treatment will find that having a filled out emergency medical consent form at the ready can help them out. There are times when an individual need to have permission in order to help out a loved one and in order to make sure that such an individual receives all of the care that they need. In such times, a medical treatment authorization and consent form can be helpful. Such a form allows an individual to get their loved one set up with the care that they need. Such a form allows an individual to look out for someone that they care about and to make decisions for that individual that will be good for the individual and provide them with much needed help.